The FSA can’t stop Virgin stripping another £345 million from Northern Rock deal, explains Cormac Hollingsworth. Lib Dem peer Lord Oakeshott has expressed concern that Virgin are planning a further asset strip once the deal has closed. Shadow Treasury minister Chris Leslie directly asked Minister of State Mark Hoban on Monday (see Hansard) what level of capital would be left in Northern Rock in three years time. Hoban didn’t answer the question. In fact, as Chris Leslie said in his speech, the FSA has been fighting a rearguard action on trying to stop asset stripping of Northern Rock. At the end of September, it was reported the Financial Services Authority (FSA) – the quango with the job of regulting the banks – was fighting with the Treasury to stop £500 million being stipped from the company. We still haven’t heard from the government about what the capital is, perhaps they don’t care. The FSA clearly does care, and according to the FT on Monday, the FSA has imposed a requirement to hold a higher amount of capital than other banks. The FT reports (£) that Northern Rock will be required to hold capital equivalent to 15% of its “risk weighted assets” – that is 15% of what it can expect to be paid back from the loans it has loaned out – or a 15% Tier 1 ratio as it is often abbreviated to. Another way to describe the ratio is as equity divided risk weighted assets. Equity is essentially ways of borrowing that aren’t straight debt, such as so-called ‘subordinated debt’ which are higher risk debt for creditors. For most other banks, 10% is the required ratio, so the Northern Rock number is 50% higher. That should reassure depositors, and that’s the FSA’s main concern. What the FSA can’t do, of course, is stop asset stripping to reduce the equity down to that level. 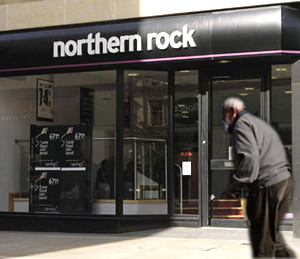 And there’s still quite a lot of equity Northern Rock could return to its new owners. 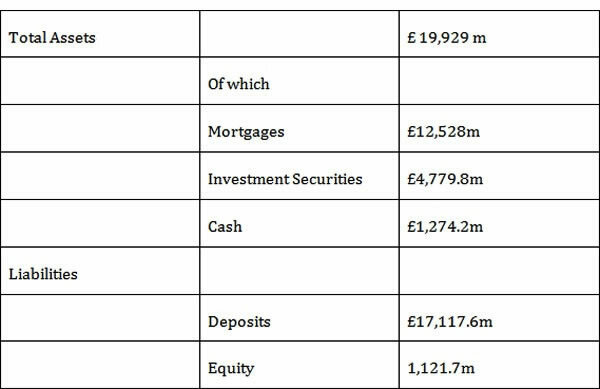 We’d like to provide you with a rough estimate of what that is using Northern Rock’s balance sheet from its interim results, June 2011. This is a relatively normal balance sheet, except for the fact there are a lot more deposits than mortgages. And this is the real value of Northern Rock. This is why Wilbur Ross – co-buyer of Northern rock with the Virgin Consortium -believes its value is double what he’s paying for it (£). Unless the shareholders of Northern Rock want to change the business to seriously put effort into innovation and improving the business, what they should do is continue lending net mortgages until they have lent out all their deposits. That will generate enough profits for the company to have a stable predictable cash flow. We can assume the investment securities on Northern Rock’s balance sheet in June 2011 are very low risk weighted – that is they are loans the bank can expect a very high return on, as they are likely to be government gilts, and thus the main contributor to risk on the bank’s assets are the mortgages. We have to recall that equity has been reduced by £250 million to pay the government as part of an asset strip to buy the bank in the first place. Northern Rock under Virgin’s ownership will have a Tier 1 ratio of 22.66%. That is above the 15% target set by the FSA. How much is that 7.6 percentage points? About £345 million. Clearly, Lord Oakeshott is right to be very worried about a further asset stripping. On January 1st there will be another £345 million of excess capital available to be stripped. Thank goodness the FSA at least put a 15% limit on their Tier 1, otherwise more capital would have been available. How likely is it the Virgin consortium will seek to take the money out? I think it’s very likely for the following reason: it almost matches what money they invested: £250 million from Wilbur Ross plus £50 million from Abu Dhabi and £50 million from Virgin. It’s beginning to look like quite a smart transaction when the consortium get the money they invested back within a year, and still retain a 100% share in Northern Rock. But one has to wonder about the value for taxpayers. Chris Leslie said on Monday, that the excess capital in Northern Rock has been sold for 66 pence on the pound, and this is what we showed yesterday. Including the £250 million that goes on January 1st, there is £600 million of excess capital Virgin has bought for £396 million, and what’s even more galling is that £150 million of that excess capital has been vendor-financed by the government at 0% interest.